AgustaWestland AW139. Helicopter is delivered in 2009, completed into VVIP class and entered into service as well as in VIP operation in 2010. Has only TTSN: 1700 hours, is practically new and in excellent condition, because always maintained to the highest possible standards! Helicopter is rarely for sale with two Interiors with Air conditioning. Corporate (standard) for 12 passengers and VVIP class 8 Leather seats Interior with Air conditioning. 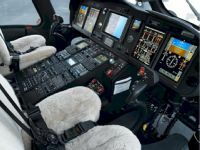 Helicopter has most Advanced FSV Avionics with 4-Axis Autopilot, EVS-1500 (Enhanced Vision System). Recorders: CVR and FDR. Valuable optional equipment including Aux Fuel Tank System; External Hoist Provisions. EASA Approved. Ready for delivery with Fresh Export Certificate of Airworthiness. One TOP VIP governmental owner and user since new. No damage history. For sale with two interiors.